Kitchens come in many shapes and forms, which is great because it gives you an opportunity to be creative. A common misconception is that small kitchens do not have many layouts, which is not true. Homes with small kitchens can be transformed with the right knowledge and a touch of creativity. Kitchens were never meant to be large. The early examples of kitchens were small because people mostly cooked in the room. This has changed overtime. Now, people use the kitchen as a place to talk or do homework. Furthermore, developers and manufacturers have pushed the idea that homeowners should have large kitchens. The reason is probably so they can fit many appliances in them. Consumerism has changed the kitchen and attempted to make it bigger than what it was originally made to be. As a rule of thumb, a regular kitchen represents anywhere between 10 to 15 percent of the total living space. 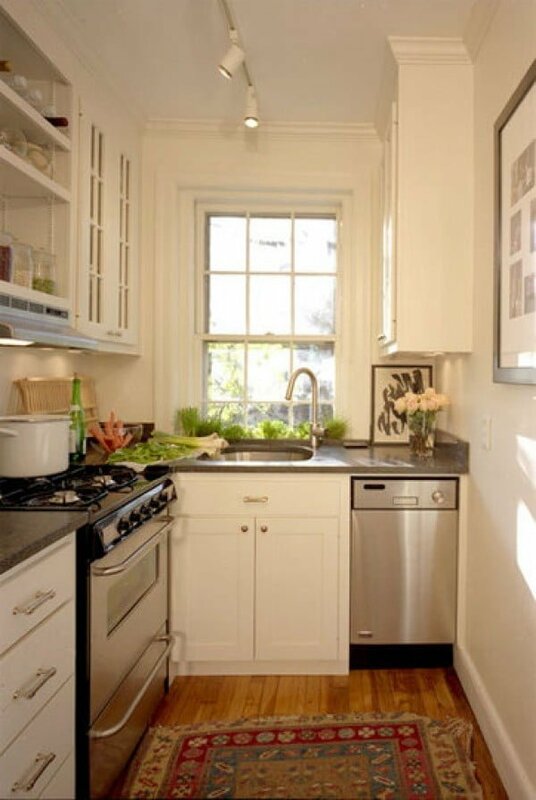 At the moment, a small kitchen is any kitchen that is smaller than 70 feet. Of course, this could be subjective because if you feel like your kitchen is too small, then it may be. 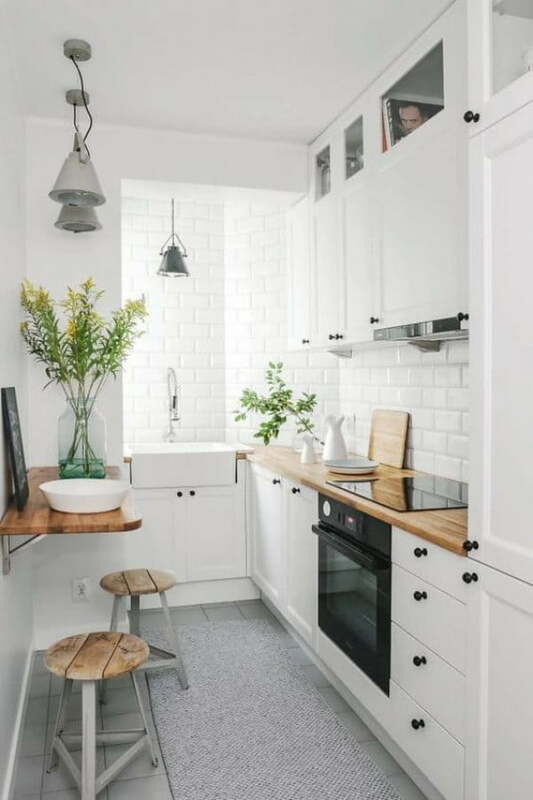 Now, you know a little more about small kitchens, but you still have to learn about the many layouts you have available to you. The following are some layouts to consider. 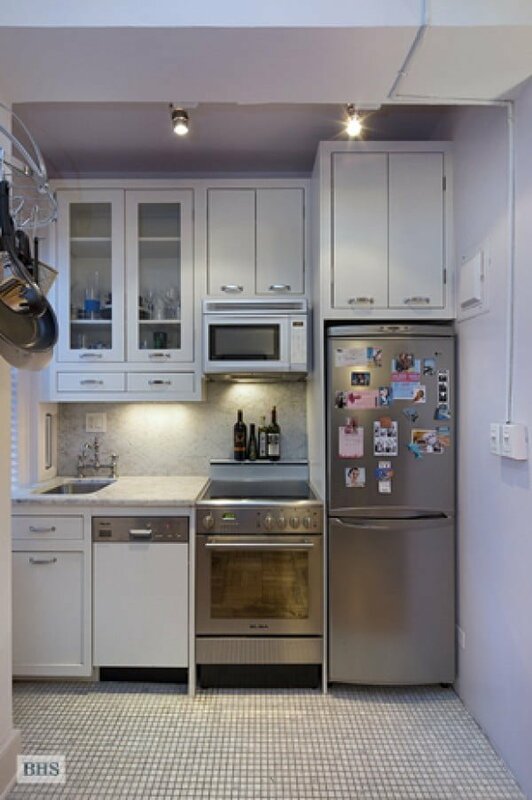 The idea behind a wall gallery kitchen layout is to place all of the appliances and cabinets along one wall. This layout is usually perfect for small studios or even lofts. It saves a lot of space while still providing a look with a unique sense of style. This is not to say that there are no drawbacks. Stringing the appliances along one wall makes it hard to cook comfortably. Food, utensils, and cooking appliances are now further apart from each other. Another drawback involves breaking down the wall if you are planning to do that built-in look. This project could get expensive, so this layout deserves some thought before deciding on it. The parallel kitchen, which is sometimes called the Galley, is perhaps one of the most efficient layouts. It is great for small places with small square spaces. The idea behind this particular layout is to use two walls, facing each other, to create the kitchen. 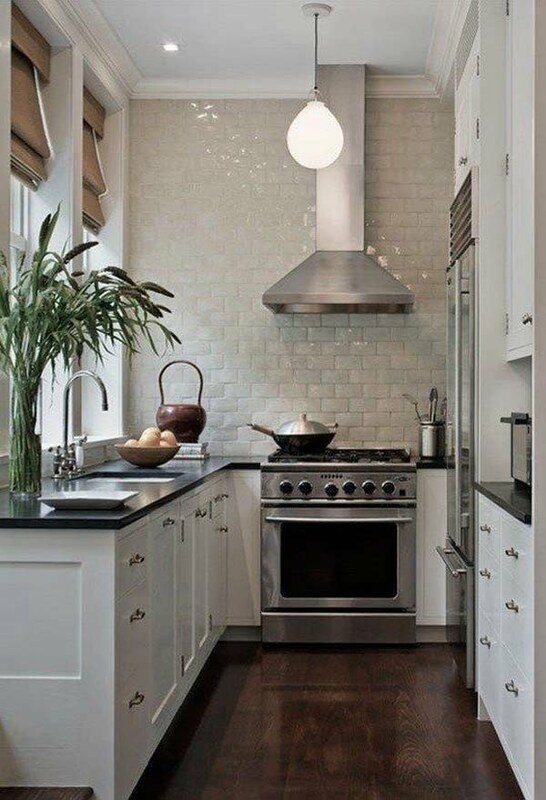 Each wall may have countertops and cabinets, which makes everything a lot more accessible for the cook. One of the biggest pros about this particular layout is that there will be no need to deal with troublesome corners. 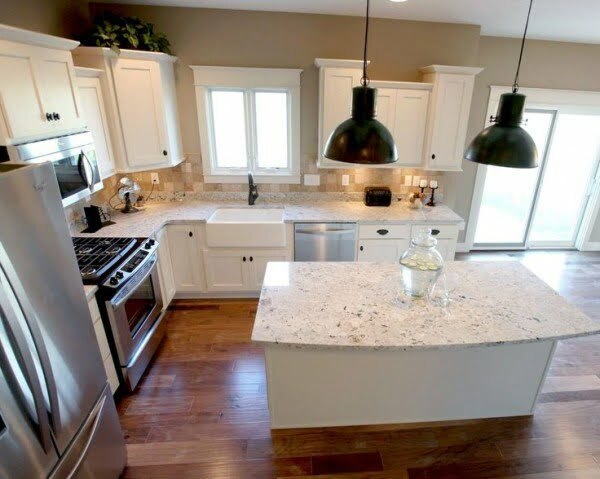 Every kitchen builder will tell you that placing cabinets or countertops around corners is time-consuming and costly. The only little hiccup to consider is that this floorplan is relatively common. This means you have probably seen it over and over again. This is not to say that you cannot add splashes of color or design accents to make the layout more unique, but it is something to think about. The L-shape kitchen layout is a very popular design for small kitchens. One of its most surprising pros is that it is able to maximize corner space like no other design. The key to the L-shape layout is to place two perpendicular countertops on corresponding walls. Another great thing is that it will help avoid that issue some kitchen layouts have regarding foot traffic. 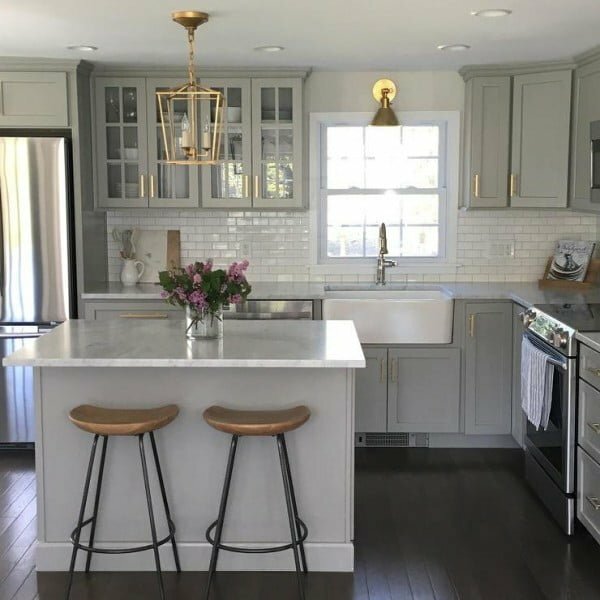 For example, the parallel kitchen layout mentioned earlier will likely get crowded because someone in your home will want to go in the fridge at some point. This does not happen with an L-shape kitchen layout. Counter space is slightly bigger with this particular layout. This could be good, which means more space for appliances and to prepare food, but it can be bad. Countertops can be expensive, especially if you choose special type of material. The U-shape kitchen layout or the horseshoe layout is an interesting and unique design. It allows for additions and can make the kitchen feel like a safe haven. Now, it does use a lot of wall space since it needs three walls to fit all the cabinets, appliances, and countertops. 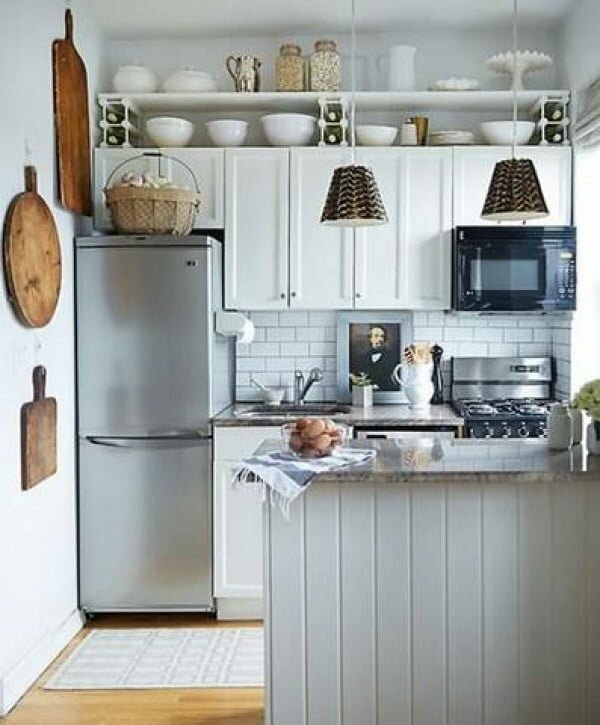 The use of space is an issue, especially for those with a small kitchen. It will not feel crowded provided you have enough space, but it still eats up more space than some of the other layouts mentioned. It should be noted that some small kitchen designs opt to turn the L-shape design into an U-shape design by adding a kitchen island. The island will act as the third wall, and it will save space. Islands always look great and could really transform a small kitchen. It should be noted that this particular layout can accommodate more appliances and countertops, so it might be a bit pricey. Still, it might be the right choice for those seeking to make a statement with their kitchen. The island is one of those additions that can transform any kitchen or home with limited space. Those having trouble finding a dining area should consider enclosing the kitchen with an island. One side can serve as an area to prepare food and to store kitchen tools while the other can be a table as long as you use stools. The island can work with almost any kitchen layout to give it a sense of style. You already know it can work with U-shape layouts, but they can also work with gallery kitchen layouts and L-shape layouts. Of course, kitchens that are simply too small may not be able to add an island, so it is important to find out if it is possible. Sure, it may be helpful, but it is still an addition and an expense that you can avoid. Those whose kitchens are not large enough for an island might want to consider a peninsula. In essence, the layout connects an island to another layout, such as the L-shape kitchen layout. The connection between the island and the rest of the layout gives this kind of design more clearance, which could make this island addition possible. Again, you will be giving up some space, but those with limited space can still use the peninsula end as a table just in case. 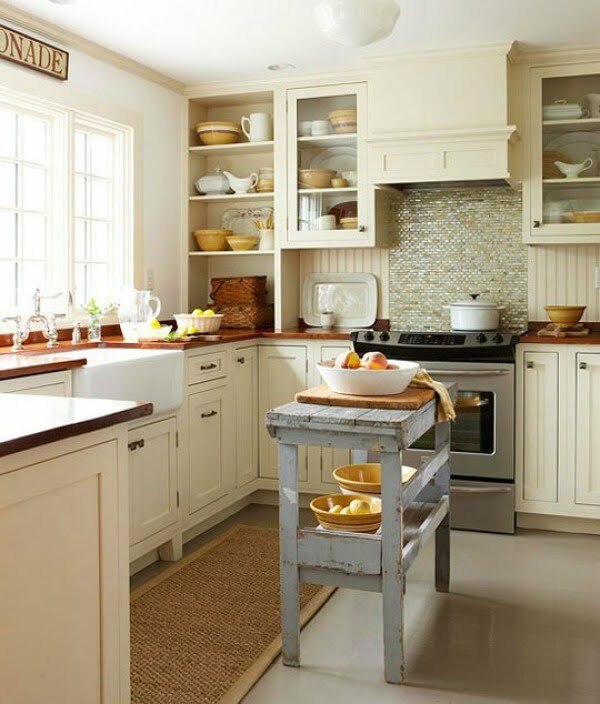 These are just some of the small kitchen designs out there that you should consider. The key here is to be open to different layouts to try to find the one that provides the most space and comfort.